Jenni and I didn’t have a lot of time in Montreal, but that wasn’t actually a problem for us since the weather was pretty miserable. We met for a quick breakfast so I could check Montreal bagels off my to do list. 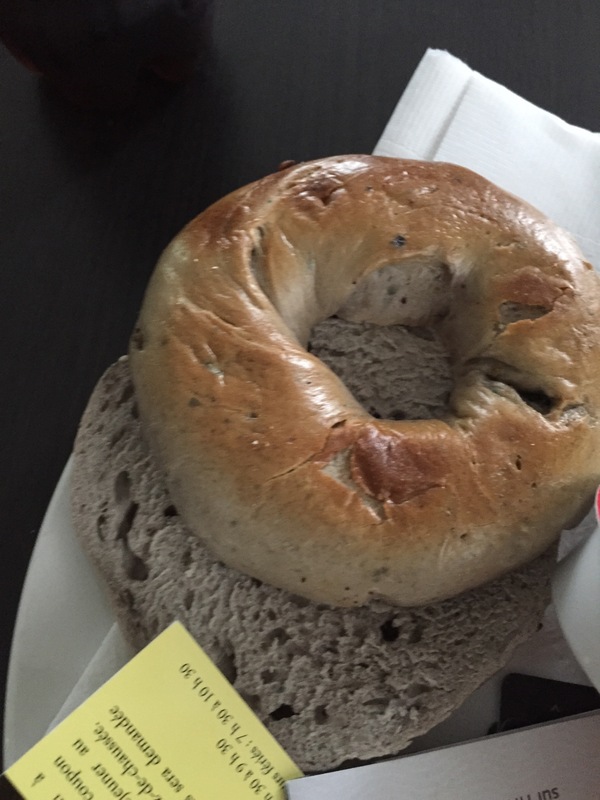 Montreal is famous for their bagels. 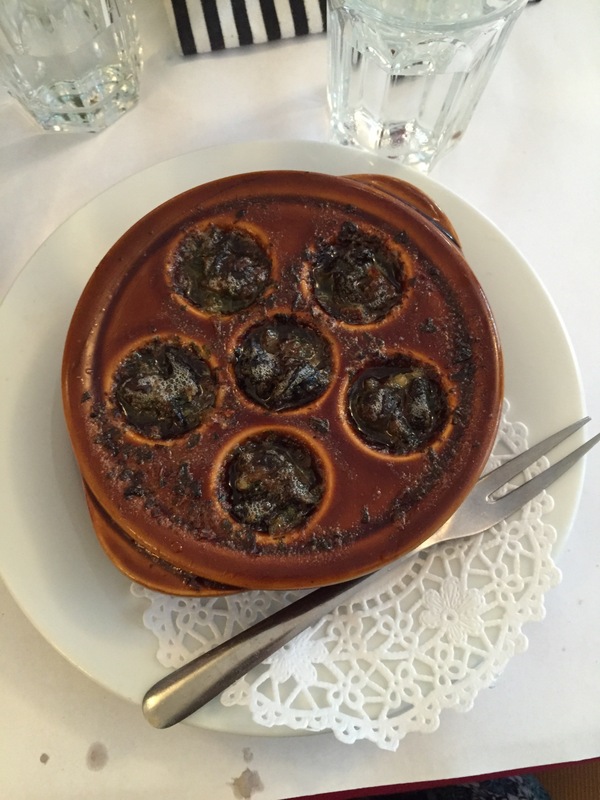 Apparently they cook them in a wood fired oven. I’m not sure of the difference between that and a New York bagel, but they were WAY better than the bagels in a bag you get in your typical grocery store. It was a little chilly and very wet when we left the hotel so we decided to start our tour in the underground city. I’m not sure if that’s where we ended up when we told the concierge where we wanted to go, but we did make it underground and found a tremendous number of shops! 60 boutiques sounds impressive. 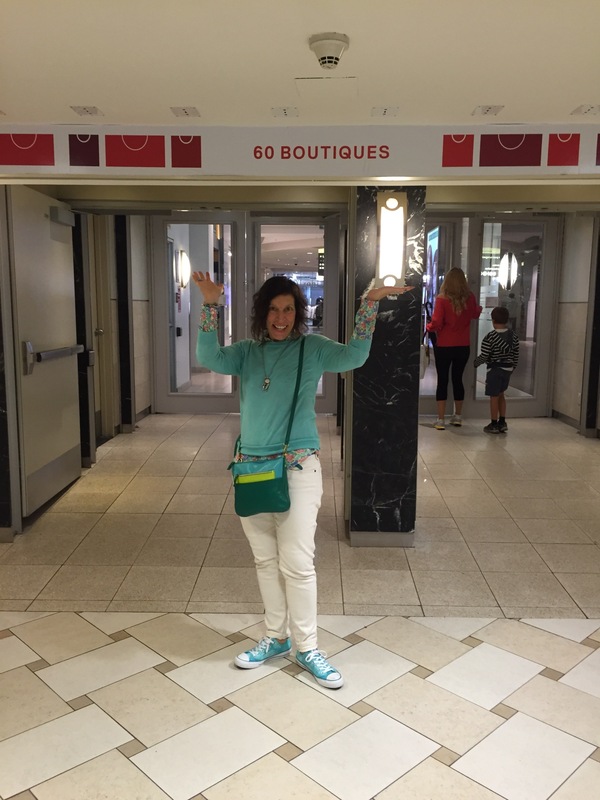 There were actually 60 boutiques in just that wing! There were dozens of wings and two or three different floors, (that we found). The first shop we stopped in was the Dollarama. They had umbrellas and we thought those would be a good investment. 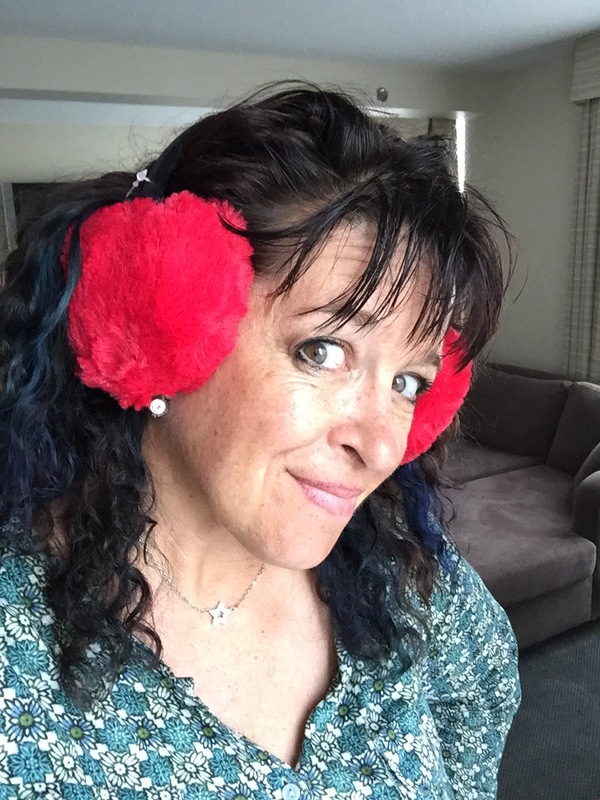 I also found some adorable red heart earmuffs. Score! Super cute and only $3 Canadian which is probably like fifty cents in the US! Also, I think the red makes my new blue hair pop. We stocked up on a few other essentials like candy and gum and then ventured out into the rest of the mall. 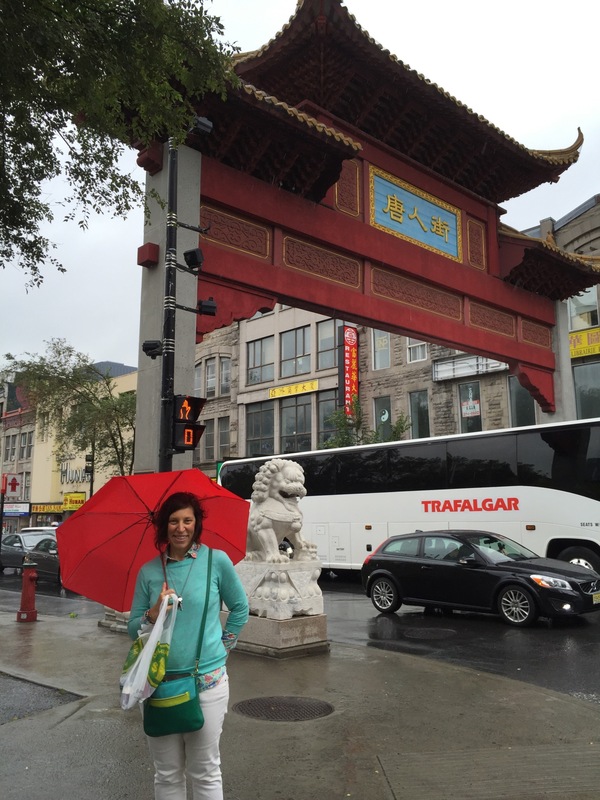 There were a lot of shops and we wandered through them for a while but then we decided to utilize our new umbrellas and see more of the city. We wandered up and down a few streets and even stumbled across Chinatown and the red light district (which was much easier to find than Amsterdam, but a lot smaller and seedier!) 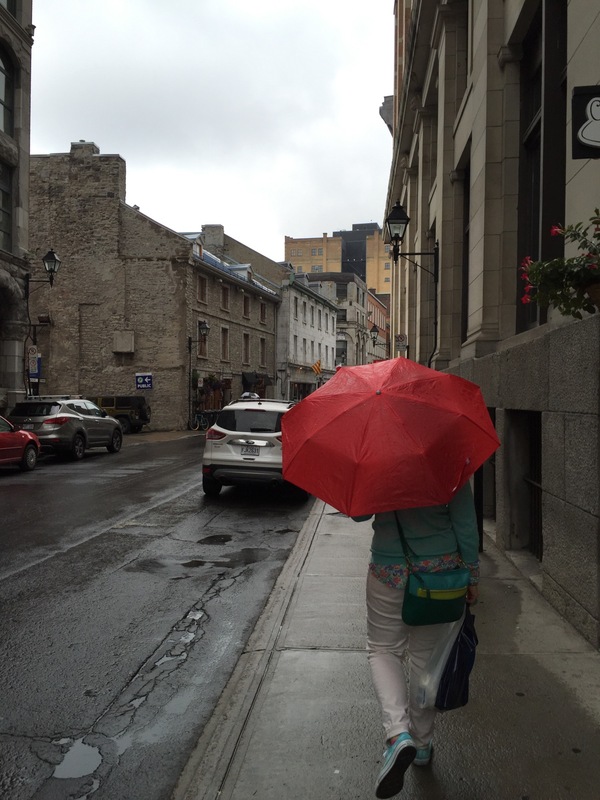 We walked to the Notre Dame Basilica from there. 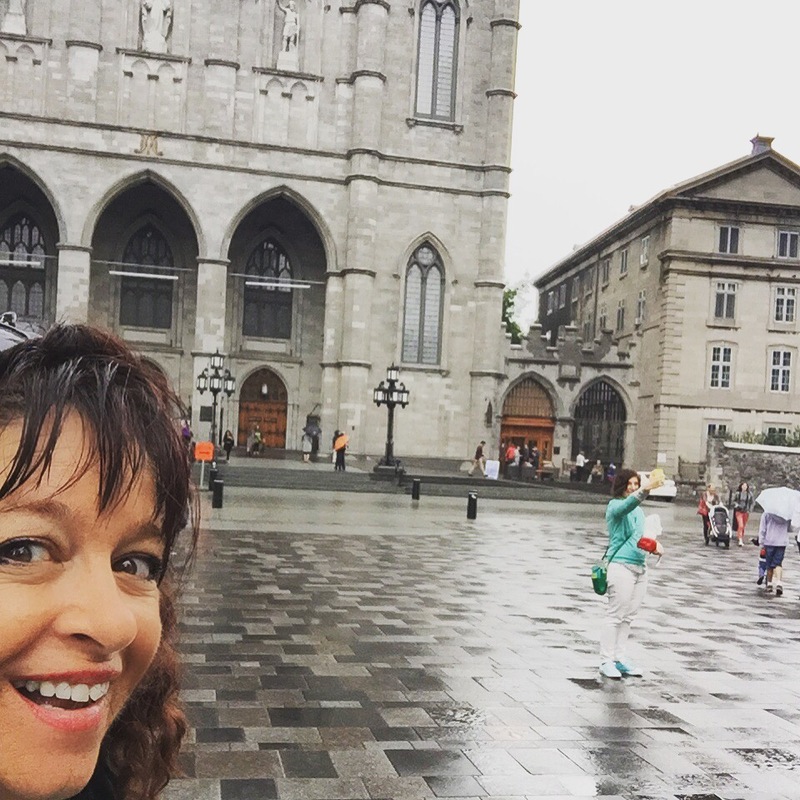 My selfie of Jenni’s selfie in front of Notre Dame. 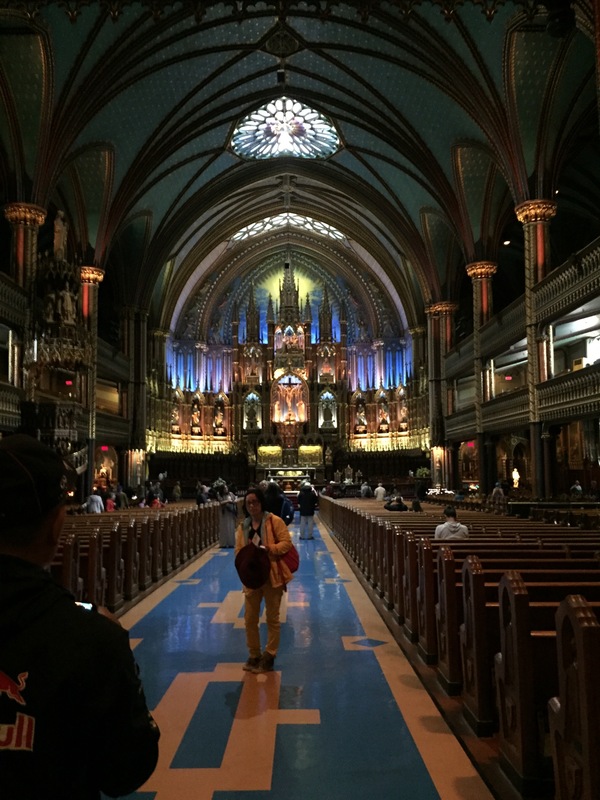 Notre Dame Basilica was just as beautiful on the inside as it was on the outside and only cost $5 for a tour. Hard to take a shot without tourists, we were everywhere! It was getting late and we were hungry so we walked to a small cafe down the street. After lunch we felt refreshed and decided to shop for a few souvenirs. Saint Paul Street was full of cute little souvenir shops. As the day wore on, we decided to head back to the hotel to dry out and take advantage of the dozens of free drink tickets we’d acquired when we checked in. 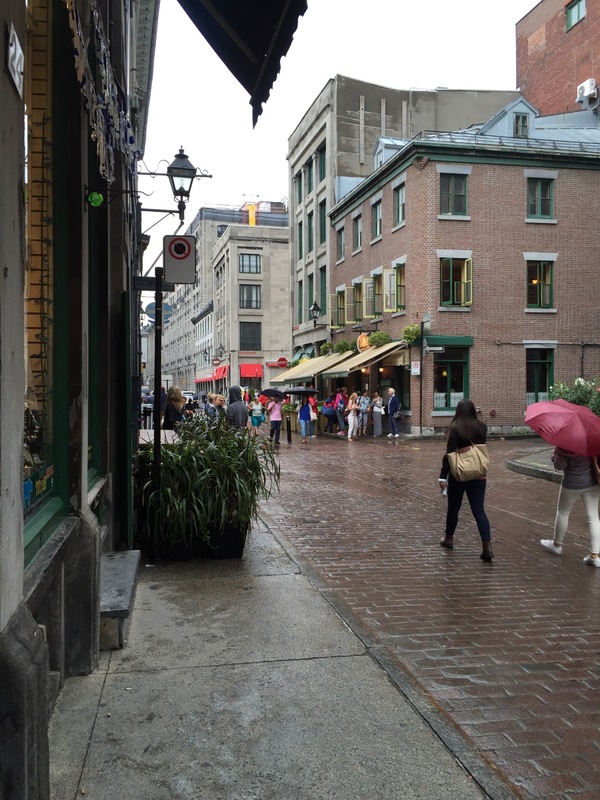 The old city in Montreal is charming but we were cold and wet! We went to our rooms to dry out and then met in the bar for happy hour. Table service was slow so I quickly realized it would be necessary to order two drinks at a time! The bartenders were swamped so we sat at a table and waited for the waiter to come over. It took so long we decided to order our drinks two at a time. Thankfully, Jenni doesn’t drink so I could order one for me and one for “her”. 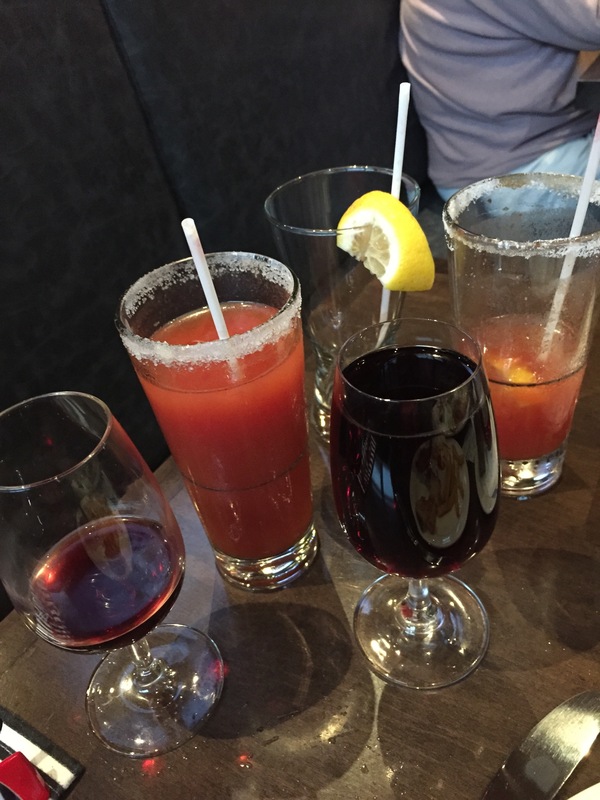 I started with a Bloody Mary because it’s a healthy choice. Sadly, their version involved a TON of tomato juice and a few tablespoons of tabasco. I choked one down but the next time we caught the waiters eye I switched to red wine instead. It wasn’t much better, but the more I drank the better it got! We’d booked a ghost tour for that evening and had to walk to the ticket office to meet our guide. By the time we left the Doubletree, it was really raining hard and the temperature had dropped even more. 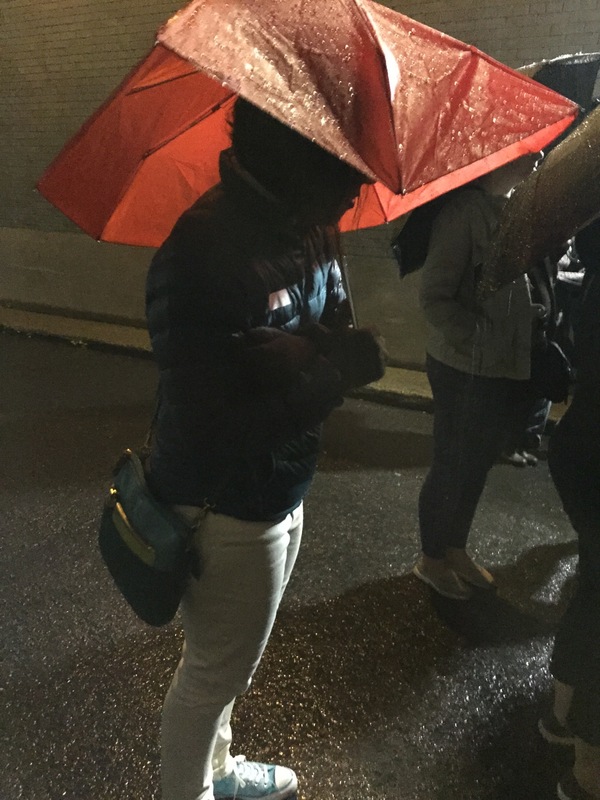 Look at how perky our umbrellas were! Mine even said Canada which seemed like it would make a great souvenir to take home! We’d been told to meet our guide at the Place Royal, which was the first town square of Montreal. There were at least 50 other tourists huddled under their own umbrellas waiting as well. They’d divided us into three groups. When our guide arrived, our group followed her down an alley to another street. Our tour guide was entertaining and looked creepy enough. There were some rude American girls who were giggling and heckling the tour guide as she began telling her stories. The first story was about a hanging or something. I’m not sure because the rude American girls were all crowding around the tour guide and had positioned their umbrellas so that nobody could see past them or hear what was going on. Suddenly, we took off walking again and trudged through huge puddles hidden by cobblestones in dark alleys. When she stopped to tell another story we began to realize that her stories were random and had nothing to do with were we were standing. 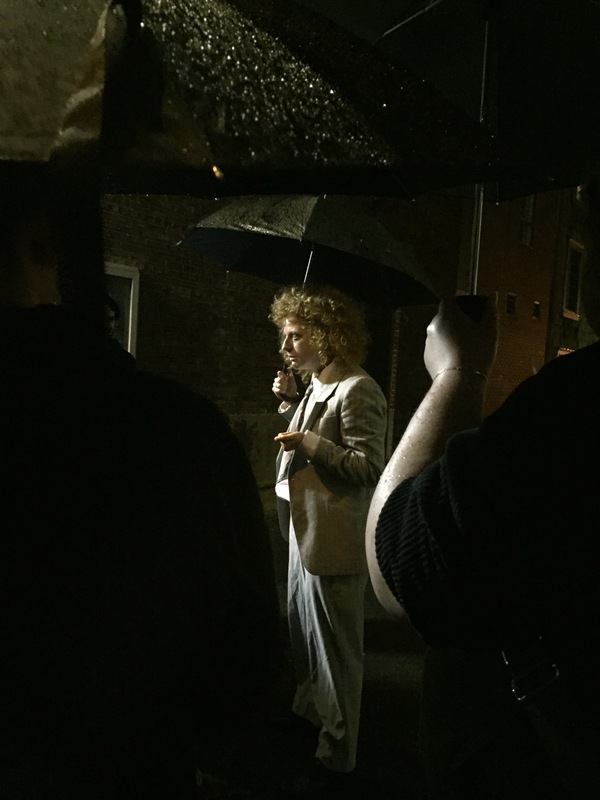 Then we started to wonder why we were walking in circles in the pouring rain. Heavy winds were causing our umbrellas to fail! We walked around a bit more but to be honest, Jenni and I weren’t having a ton of fun. We just kept getting wetter and colder and wetter and colder and finally I suggested we sneak away and head back to our hotel so I could try to drown myself in my jacuzzi tub! 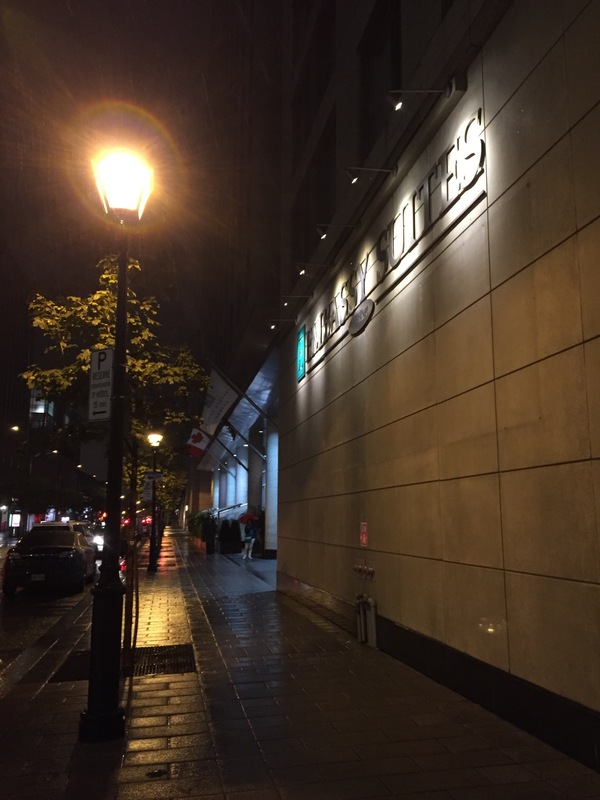 It was a long, cold walk but my unfailing sense of direction led us right to the Embassy Suites! The first thing we did when we walked in the door was cram those poor broken umbrellas in the trash can! 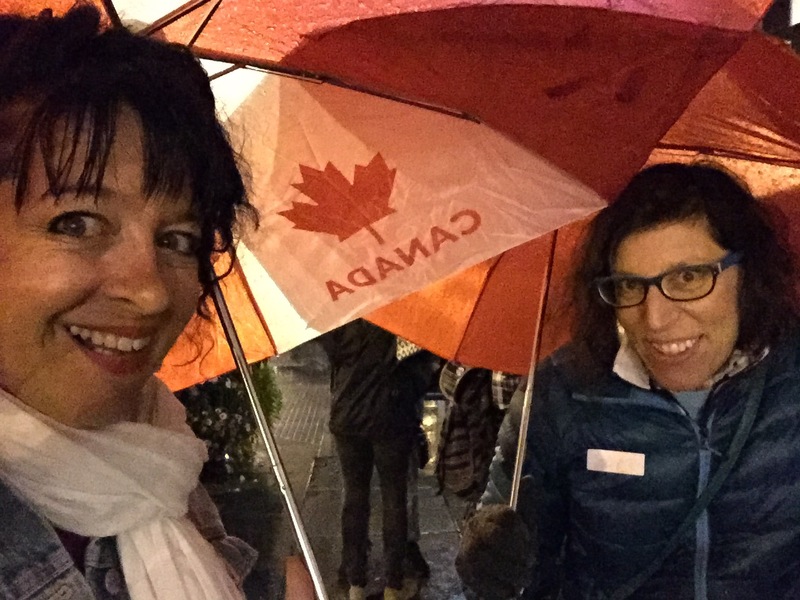 This entry was posted in Getting Around, Life Story and tagged 2015, bagel, boutique, earmuffs, embassy suites, escargot, Ghost Tour, Montreal, notre dame basilica, shopping, umbrellas. Bookmark the permalink.